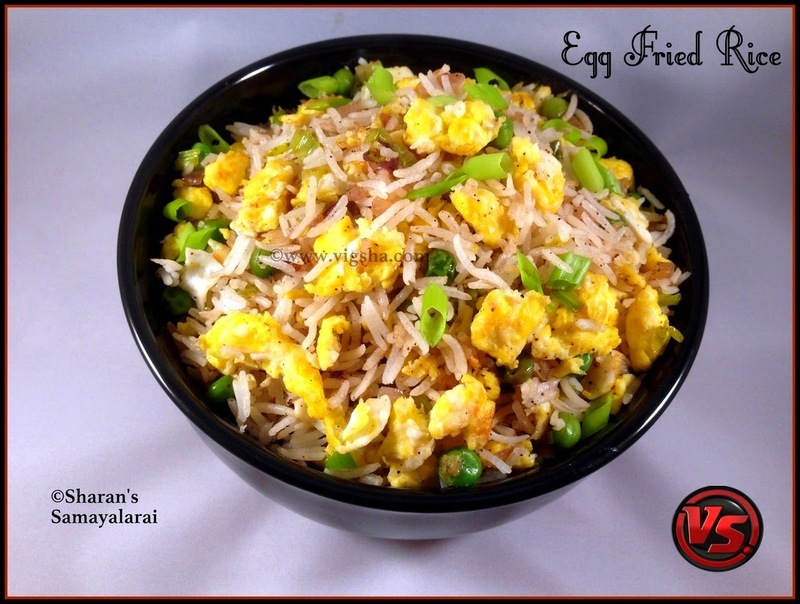 Egg Fried Rice is one of the popular Indo - Chinese recipe. Egg combined with veggies, soy sauce and tossed together with steamed rice on a high flame make this a simple, but delicious meal. It will be done in few minutes if you have all the ingredients ready. 1). Wash and cook the rice, once done fluff it with a fork and spread it on a plate. Then mix a tsp of oil to the cooked rice so that grains are separate, keep aside. Heat a pan and drizzle oil, break the eggs, add little salt, pepper and scramble them. Keep aside. 2). Finely chop the spring onions. Heat oil in a pan and saute the chopped spring onions (both green and white part) and onions till they turn translucent. Reserve few green part for garnishing. 3). Then add the frozen peas and cook for few minutes. In a high flame (gives smoky flavor), add a tsp of soy sauce and saute, stirring continuously. Then green chilli sauce along with pepper powder and salt. Mix everything together until everything gets blended well. 4). Add the steamed rice along with scrambled eggs and toss everything together. Garnish with spring onions greens. Serve hot ! I served it with Chicken fry ..
# You can use any type of rice for this recipe. But I personally like long-grain rice. # Don't skip spring onions, it adds more flavor to the rice. # You can add any veggies of your choice like carrots, beans, etc..
# For veggie version of this fried rice, just avoid step1 (egg part) . # You can also you left-over rice for the same recipe. # Before mixing the rice, make sure the rice is cooled and grains are separate. Else it will become mushy. # Do not over cook the vegetables. The vegetables should retain their crunchiness. # I normally dont add ajinomotto, but you can add it if you wish.